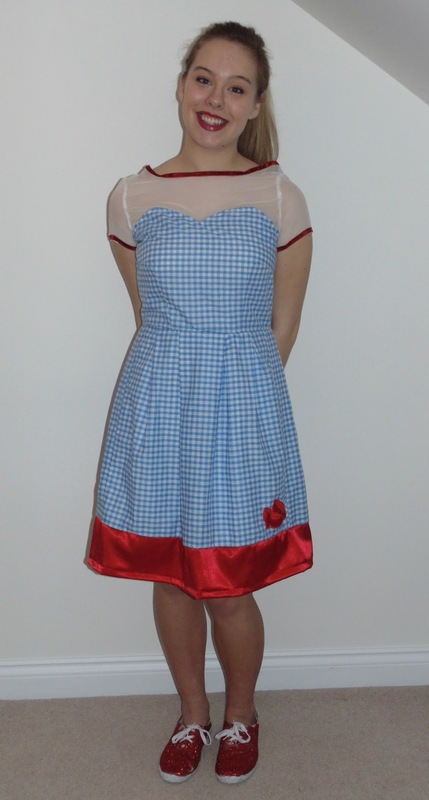 LittleEllieMae: My Modern Dorothy (Wizard of Oz) Dress! 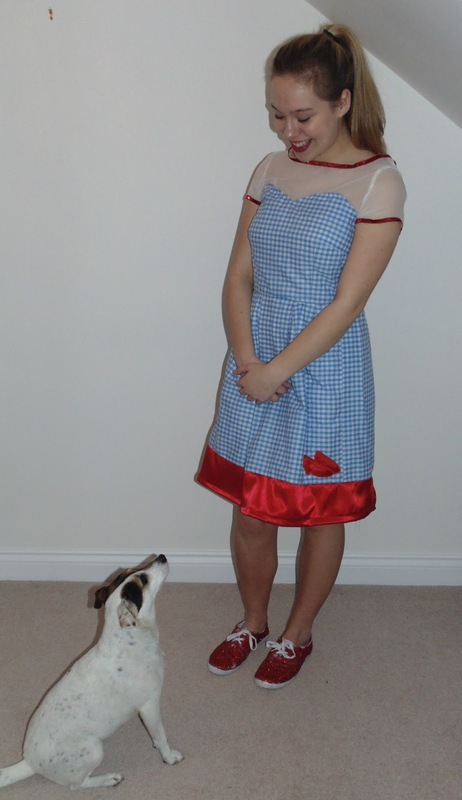 My Modern Dorothy (Wizard of Oz) Dress! So, I've been taking GCSE Textiles for 3 years now and its one of my favourite subjects. As part of my final GCSE this year I was given a design brief to produce a garment for a west end show of my choice with a modern twist. 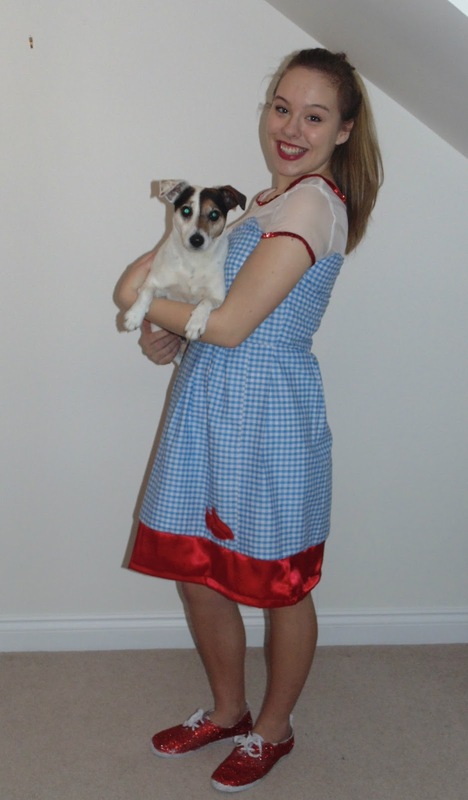 I chose The Wizard of Oz as my west end show to create a garment for because its one of my all time favourite musicals and I was lucky enough to see it at the amazing London Palladium a few years ago. I won't bore you with all my textiles coursework but I really wanted to share with you my finished product as I'm really pleased with it! I've grown up with all of my family sewing, so I've always know how to do it but this is my first attempt at making a whole outfit so it was exciting! This is my finished product! I went with the traditional blue and white gingham and played on the red of the traditional ruby slippers (even including a little motif of them at the bottom of the dress) for the colour scheme. To make this dress a modern version, I used a sweetheart neckline and a sheer organza panel and a cut out at the back of the dress. I had to take photos of the dress ("in action") for my folder work so I hope you enjoy some of the photos! Say hi to little Indie, playing Toto in my photoshoot, haha! It took me a lot of hard work and effort to finish this dress by the deadline (took up A LOT of my school lunchtimes over the past few months!) so I'm pleased to finally show it to the world! Okay, I admit that its a dress that I will obviously not wear on a day-to-day basis but who knows what fancy dress party I'll be going to soon! To go with the dress I created my own ruby slippers (with again, a modern twist!). 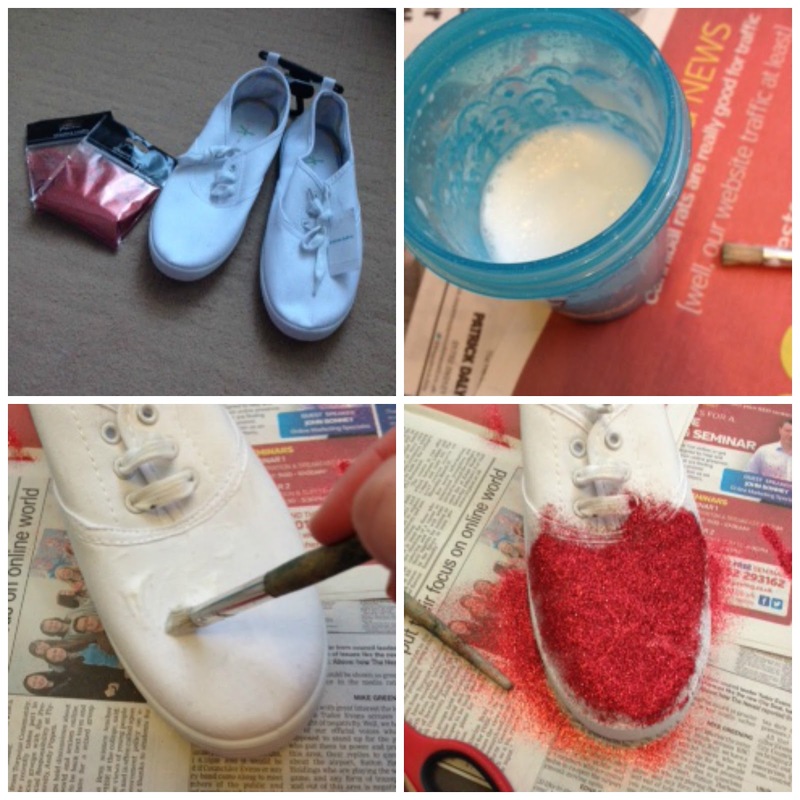 I used some white £3 pumps from Primark and brought some red glitter from Paperchase. The D.I.Y. on Pinterest told me to use ModPodge but I refused to spend that amount of money on some glue so I made my own! I just used PVA glue with water- works just as well! I coated the pumps with the glue and covered in the glitter. I'm still finding glitter all over my bedroom and I did it a week ago haha! To seal the glitter in I sprayed it with hairspray after it had completely dried (I left it 48 hours). And this is the (pretty much) finished product of the ruby slippers (minus the laces!). It was a super cheap alternative to buying sparkly red shoes and it was very fun too!